PLEASE READ AND REVIEW THE FOLLOWING TERMS AND CONDITIONS OF USE AGREEMENT ("Agreement?) CAREFULLY BEFORE USING THIS SITE AND ASSOCIATED SERVICES. By using this Site, you agree to this Agreement. If you do not agree, please do not use this Site. This Site is owned and operated by The Interior Gallery, LLC ("TIG? ), and TIG reserves the right to change this Agreement, in whole or in part, at any time without prior notice to you. Accordingly, you should always review this page prior to using this Site and or services in order to ensure that you understand the terms under which you are permitted access. This Web site provides information that, while useful, must not be used as a substitute for the advice of your own professional contractor. Always carefully read the information provided with your products. TIG reserves the right to correct any inaccuracies or typographical errors in the information posted on this Site, and shall have no liability for such errors. Information may be changed or updated without notice and prices and availability of goods are subject to change without notice. The content provided through this Site is for informational purposes only and is not intended to provide specific advice for you or your specific installation needs, and should not be relied upon in that regard. YOU SHOULD CAREFULLY READ ALL INFORMATION PROVIDED BY THE MANUFACTURERS OF THE PRODUCT(S) ON OR IN THE PRODUCT(S) PACKAGING AND LABELS BEFORE USING ANY OF THE PRODUCT(S). 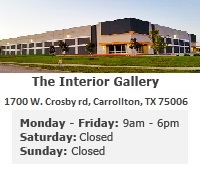 "www.theinteriorgallery.com" and "The Interior Gallery? are among the trademarks and/or service marks of TIG. All other trademarks, logos and copyrights are the property of their respective owners. All text, graphics, user interfaces, visual interfaces, photographs, trademarks, logos, sounds, music, artwork and computer code (collectively, "Content"), including but not limited to the design, structure, selection, coordination, expression, "look and feel" and arrangement of such Content, contained on this Site is owned, controlled or licensed by or to TIG and is protected by copyright, patent and trademark laws, and various other intellectual property rights and unfair competition laws. Except as expressly provided in this Agreement, no part of this Site and no Content may be copied, reproduced, republished, uploaded, posted, publicly displayed, encoded, translated, transmitted or distributed in any way (including "framing? or "mirroring") to any other computer, server, website or other medium for publication or distribution or for any commercial enterprise, without TIG?s express prior written consent. YOU AGREE TO NOT USE TIG?S trademarks, service marks, trade names or Internet domain names to disparage TIG, TIG?s services or products, TIG?S OFFICERS, DIRECTORS OR EMPLOYEES, or otherwise take any action to damage TIG?s goodwill or reputation. You hereby agree to indemnify and hold TIG, and its subsidiaries, affiliates, officers, directors, agents, co-branders, partners and employees harmless from any claim or demand, including reasonable attorneys? fees, made by any third party due to or arising out of your use of the Content on this Site, or any content you submit, post, or transmit through this Site, your use of this Site, your connection to this Site, your violation of this Agreement, or your violation of any rights of another. Links from or to websites outside this Site are meant for convenience only. TIG does not review, endorse, approve or control, and is not responsible for any websites linked from or to this Site, the content of those websites, the third parties named therein, or their products or services. Linking to any other website is at your sole risk and TIG will not be responsible or liable for any damages in connection with linking. TIG disclaims all warranties, express and implied, as to the accuracy, validity and legality of any materials or information found on those websites. This Site is generally available to users twenty-four (24) hours per day, seven (7) days per week, three hundred sixty-five (365) days per year. TIG, however, retains the right to make this Site unavailable at any time, for any reason, and for any length of time. By using this Site you agree that TIG will not be liable for any damage arising out of or related to any such interruption, suspension, or termination of this Site and/or the services or products contained therein. Upon acceptance of these terms and conditions of use, TIG authorizes you to view the Content on this Site solely for your personal use. The material on this Site is intended solely for individuals enquiring about products or services made available through this Site. If you are not accessing this Site for such purposes, you may not use this Site. TIG PROVIDES CONTENT ON THIS SITE AS A SERVICE TO YOU, OUR CUSTOMER. THIS SITE MAY NOT CONTAIN ALL INFORMATION THAT IS APPLICABLE TO YOUR PERSONAL CIRCUMSTANCES. THE CONTENT IS NOT INTENDED FOR GENERAL EVALUATION AND SHOULD NOT BE USED AS A SUBSTITUTE FOR CONSULTATION WITH YOUR PROFESSIONAL CONTRACTOR. THE CONTENT OF THIS SITE, THE COMPUTER SERVER THAT MAKES IT AVAILABLE, AND THE SERVICES AND PRODUCTS TIG PROVIDES ON THIS SITE, ARE PROVIDED ON AN "AS IS? AND "AS AVAILABLE? BASIS WITHOUT WARRANTY OF ANY KIND, WHETHER EXPRESS, IMPLIED OR STATUTORY. TIG EXPRESSLY DISCLAIMS LIABILITY FOR TECHNICAL FAILURES (INCLUDING HARDWARE OR SOFTWARE FAILURES), INCOMPLETE, SCRAMBLED OR DELAYED COMPUTER TRANSMISSIONS, AND/OR TECHNICAL INACCURACIES, AS WELL AS UNAUTHORIZED ACCESS OF USER TRANSMISSIONS BY THIRD PARTIES. FURTHER, TIG DOES NOT REPRESENT OR WARRANT THAT NO VIRUSES OR OTHER CONTAMINATING OR DESTRUCTIVE PROPERTIES WILL BE TRANSMITTED, OR THAT NO DAMAGE WILL OCCUR TO YOUR COMPUTER SYSTEM. YOU HAVE SOLE RESPONSIBILITY FOR ADEQUATE PROTECTION AND BACKUP OF DATA AND/OR EQUIPMENT AND TO TAKE ALL PRECAUTIONS TO SCAN FOR COMPUTER VIRUSES OR OTHER DESTRUCTIVE PROPERTIES. BY YOUR USE OF THIS SITE, YOU ACKNOWLEDGE THAT SUCH USE IS AT YOUR SOLE RISK, INCLUDING RESPONSIBILITY FOR ALL COSTS ASSOCIATED WITH ALL NECESSARY SERVICING OR REPAIRS OF ANY EQUIPMENT YOU USE IN CONNECTION WITH THIS SITE. TO THE FULL EXTENT NOT PRECLUDED BY APPLICABLE LAW TIG, AND ITS SUPPLIERS, DIRECTORS AND EMPLOYEES DISCLAIM AND EXCLUDE ALL WARRANTIES WITH RESPECT TO ALL CONTENT, EXPRESS, IMPLIED OR STATUTORY. THIS DISCLAIMER INCLUDES, BUT IS NOT LIMITED TO, ANY AND ALL WARRANTIES OR MERCHANTABILITY, FITNESS FOR A PARTICULAR PURPOSE, AND NON-INFRINGEMENT. TIG DOES NOT WARRANT THE CONTENT TO BE ACCURATE, COMPLETE OR CURRENT. TIG DOES NOT WARRANT THAT THIS SITE WILL OPERATE WITHOUT ERROR, THAT DEFECTS WILL BE CORRECTED OR THAT THIS SITE OR THE SERVER MAKING IT AVAILABLE ARE FREE OF VIRUSES OR OTHER HARMFUL COMPONENTS. PRICE AND AVAILABILITY CONTENT, AS WELL AS OTHER CONTENT CONTAINED IN THIS SITE OR ACCESSIBLE THEREFROM, IS SUBJECT TO CHANGE WITHOUT NOTICE. YOU ACKNOWLEDGE AND AGREE THAT TIG DOES NOT ENDORSE THE CONTENT OF ANY SITE ACCESSED VIA LINKS OR OTHER MEANS FROM THIS SITE AND IT IS NOT RESPONSIBLE OR LIABLE FOR SUCH CONTENT EVEN THOUGH IT MAY BE UNLAWFUL, HARASSING, LIBELOUS, PRIVACY INVADING, ABUSIVE, THREATENING, HARMFUL, OBSCENE, OR OTHERWISE OBJECTIONABLE, OR THAT IT INFRINGES OR MAY INFRINGE THE INTELLECTUAL PROPERTY OR OTHER RIGHTS OF ANOTHER PERSON. THIS SITE INCLUDES CONTENT PROVIDED BY THIRD PARTIES AND YOU, OUR CUSTOMER. TIG IS ONLY A DISTRIBUTOR OF SUCH CONTENT AND NOT ITS PUBLISHER. TIG?S EDITORIAL CONTROL OF SUCH CONTENT IS THE SAME AS THAT OF A PUBLIC LIBRARY OR NEWSSTAND. TIG?S THIRD PARTY SUPPLIERS MAY EXPRESS CERTAIN OPINIONS OR PROVIDE CERTAIN INFORMATION AND OFFERS. TIG MAKES NO WARRANTIES AS TO THE COMPLETENESS, ACCURACY, TIMELINESS, OR RELIABILITY OF INFORMATION OR OFFERS SUPPLIED BY THIRD PARTIES. TIG DOES NOT GUARANTEE OR WARRANT THE PERFORMANCE OF ANY THIRD PARTY, INCLUDING ANY SUCH THIRD PARTY?S CONFORMANCE TO ANY LAW, RULE, REGULATION OR POLICY. By using this Site you agree to comply with any and all local, provincial, state, federal, or international laws, statutes, and regulations that relate in any manner to the use of this Site and the associated services or products contained thereon. TIG and users of its Site are independent contractors, and no agency, partnership, employment or other relationship is created or is intended to be created by the use of this Site. You are responsible for maintaining the confidentiality of your TIG account information. TIG does not sell products to minors, but rather, sells only to adults who can purchase with a credit card or otherwise enter into contractual purchases. If you are under eighteen (18) years old, you may use our web site only with involvement of a parent or guardian. TIG reserves the right to refuse service, terminate accounts, remove or edit content, or cancel orders at its sole discretion. All items purchased from this Site are made pursuant to a shipment contract. This means that the risk of loss and title for such items pass exclusively to the customer upon our delivery of the product to the carrier. TIG attempts to be as accurate as possible in product descriptions. TIG, however, does not warrant that product descriptions or other Content of this Site are accurate, complete, reliable, current or error-free. Specifically, manufacturers may change the configuration or content of a product without informing TIG, and therefore we cannot be held responsible for such changes in a product. If product descriptions are judged to be inaccurate, the customer's sole remedy is to return the product(s) in unused condition. "Unused Condition? means that the returned product(s) must be defect-free, packed in its original carton with any and all documentation and accessories, and in original condition suitable for resale. - Shipping within the 48 Contiguous United States - FREE SHIPPING or Quoted Shipping Rate does NOT apply to Difficult Access Cities, Rural Areas, Islands, Remote Areas and so on. FREE SHIPPING Promotion is limited to a maximum amount of $200. Any transportation charges in excess of this amount are the responsibility of the customer. - No Direct International Shipping (Except Canada)- Must Provide a Forwarder - Bank Wire or Cashier?s Check is Required. - No Direct Delivery to Alaska or Hawaii - Must Provide a Forwarder - Bank Wire or Cashier?s Check is Required. SHIPPING TIMELINE - We value our customers at TheInteriorGallery.com and our commitment to deliver quality products to you is our priority. In order to provide our customers with the best value and fastest shipping results, we stock most of our items. Upon receipt of your payment, we will re-inspect your item, repackage it if needed to guarantee safe shipping, and ship it with in 1 to 3 business days (Rush Season and large order may take longer). If we do not have the item available in stock then please allow 8-12 weeks for delivery. Some special order items might take longer. RETURN POLICY -MONEY BACK GUARANTEE- If within 30 days of receiving your product you are not completely satisfied, email us or call us and we will issue a Return Merchandise Authorization (RMA) number. You can then return the product to us in the same condition we shipped it and we will promptly refund your full purchase price less initial and return shipping cost. Shipping and special order merchandise are non-refundable. A 5% Restocking Fee applies to all returns. All merchandise must be returned in good condition, prepaid, and fully insured. The item must be returned via freight truck on a pallet as it was shipped to you. The item(s) must be in the same new, sellable condition and cannot be installed. The buyer is responsible for the return charges as well as arranging and scheduling the pickup with the freight carrier to return the product. Please note we do not accept COD shipments. COD shipments will be refused at the dock and returned to sender at their expense. The Interior Gallery ships all products in the most robust possible packaging, and selects the most appropriate shipping carrier based on the items ordered. However, sometimes breakage may occur due to carrier mishandling while in transit to you. Should this happen, we will require at least two clear pictures of any damages to be either mailed or e-mailed to our customer service team (info@TheInteriorGallery.com) as evidence for any claim we may make against the freight carrier, and as a requirement to receive credit or replacement merchandise. This claim must be filed within 2 calendar days of receipt of the merchandise. The Interior Gallery reserves the right to replace damaged merchandise within 30 calendar days of notification by the customer. If a replacement item is available for shipping within that time period then a refund cannot be issued. If no replacement is available, the damaged item(s) will be refunded in full. 1. If an order is cancelled prior to shipment, payment will be fully refunded minus a 5% credit card processing fee. This is necessary to cover our costs incurred by the credit card processing agencies, which are non-reversible. Orders cancelled that were paid by cash or check will not incur this charge. Note that we consider your product to be "shipped" when it has been picked up from our warehouse by the freight carrier. After products are considered "shipped?, cancellations are treated as returns as described below. 7. Please note that custom orders may not be returned. If such products are damaged in shipment, we will assist you with freight claims, or if a product is found to have a manufacturing defect ? it will be repaired or replaced based on manufacturer's warranty policies. 8. Items being returned must ALWAYS be sent via ground transportation, insured by the sender. The sender is responsible for arranging the shipping carrier and pick-up for delivery back to The Interior Gallery, unless the return is due to no fault of the sender (for example, damaged merchandise or wrong item received) Shipping charges for items that are sent back by any means other than ground transportation (cheapest available) will be the responsibility of the sender minus the cost of the ground freight charge. This includes when the item is being returned at our expense ? it must be sent cheapest method possible. 4. Due to the nature of the products we sell, boxes that have been dropped may not show obvious signs of external damage. This is very unusual, but could happen. You may want to open these specific boxes before the driver leaves to ensure that the contents do not have concealed damage. The driver may refuse to allow you the time to open specific boxes - if this is the case, open the boxes as soon as possible, but not later than 3 business days after the delivery, to inspect for damage. If we need to replace a damaged item it is in your best interest to contact us immediately, so we don?t sell out of this item during the time you waited to report the issue. If the item is no longer available, customer service will assist you to make alternative arrangements, or arrange a refund. Please note that any additional freight carrier's fees such as re-delivery, special notification, storage due to lack of response to appointment requests and lift-gate services are the responsibility of the customer (unless otherwise noted on your order). The Interior Gallery is only responsible for curbside delivery. The Interior Gallery will pay the basic delivery charges to the curb only. If other services, such as in-home delivery services are requested by the customer and billed to The Interior Gallery, all such fees shall then be re-billed to your credit card. If the freight carrier is unable to deliver the freight due to problems with contacting you or setting up delivery appointments, storage fees may be assessed by the carrier ? in such case all storage fees are the responsibility of the customer and shall be billed to your credit card. We gladly ship to many countries outside of the US 50 states and we ship to all parts of Canada. Please call for a quote. The associated fees (customs duty, brokerage fees, and any charges associated with the clearance procedure) are the sole responsibility of the purchaser. In the event that the purchaser does not pay these fees and they become billed back to The Interior Gallery, then The Interior Gallery is authorized to charge these fees to the purchaser's credit card, or, if no card is available, to seek collection from the purchaser. PLEASE NOTE: Some product complaints MUST be handled by the manufacturer. In such cases, that is not the policy of TIG, but the policy of certain manufacturers. Your original invoice serves as dated proof-of-purchase for all purposes. No returns for refund or exchange will be accepted unless accompanied by a copy of this invoice. Prices are subject to change without notice. We are not responsible for typographical errors. We reserve the right to limit quantities and to substitute manufacturer. All merchandise is subject to prior sale. Items pictured may only be representative of the actual product. TIG?s liability for products that have defects in material workmanship is limited exclusively to replacement of the defective product, or component of product, or at TIG?s sole option, refund of purchase price. TIG are not liable for any incidental or consequential damages arising from defects produced by manufacturers of products. Customers refusing delivery of shipments are responsible for both initial and return shipping charges. Total shipping charge liability on the part of the customer will be two-times (2X) the original invoiced shipping charges. TIG also reserve the right to charge restocking fees for refusal of delivery. If Customer breaches any provision of this Agreement, including, without limitation, its payment obligation, Customer shall be in default hereunder, and all unpaid amounts shall become immediately due and payable. Upon Customer's default The Interior Gallery LLC shall have all the rights and remedies of a secured party under the Uniform Commercial Code, and any other applicable laws. The Interior Gallery LLC shall be entitled to recover reasonable attorney's fees, late fees, interest fees, court costs and costs of collection associated with enforcing its rights hereunder. This Site (excluding linked websites, if any) is administered and controlled by TIG and its affiliates, subsidiaries, officers, directors, employees or agents from its offices in the accordance with the laws of the State of Texas, USA. You agree that this Agreement and this Site will be governed by and construed in accordance Texas law without giving effect to any principles of conflicts of laws. Any action relating to this Agreement shall only be brought in a court of competent jurisdiction in Texas. You access this Site and/or associated services of TIG at your own risk, and remain responsible for complying with the laws of the jurisdiction within which you are located. The prices for the products and services on this Site are quoted, for convenience, in United States dollars and shall be as set forth on this Site as at the time of acceptance of an order by TIG. Prices for products shall be subject to change without any further notice. Credit terms are within TIG's sole discretion, and unless otherwise specified in TIG's invoice, payment must be received by TIG prior to TIG's acceptance of an order. TIG reserves the right to suspend or terminate your account if you violate this Agreement. If your violation causes harm to others, you agree to indemnify and hold TIG harmless from and against any and all loss, damage, or expense. If any dispute arises between us regarding this Agreement or your use of this Site, TIG will use its commercially reasonable efforts to resolve such matter through good faith negotiations, and you agree to do the same. TIG shall not be liable for any delay or failure in performance caused by circumstances beyond its reasonable control, including, without limitation, delays due to backorders of requested products, mail delays, customs delays or lost shipments. TIG shall not be responsible to notify the customer in the event of such delays. The customer shall be solely responsible to make other arrangements to purchase alternative products and any costs incurred in connection with such purchases. Except as expressly provided in a particular "legal notice" on this Site, this Agreement and any terms incorporated or referred to herein constitute the entire agreement between TIG and you relating to your use of this Site and the subject matter hereof, and supersede any prior understandings or agreements (whether electronic, oral or written) regarding the subject matter, and may not be amended or modified except in writing, or by TIG making such amendments or modifications in accordance with this Agreement. By clicking "I agree? when placing your order, you agree with our shipping and refunds policies. Thank you for your cooperation, and thank you again for visiting theinteriorgallery.com. Copyright 2016 The Interior Gallery, LLC. All rights reserved.